As a nurse, you will have important encounters with many people. They will be patients and their families, endowed with a mind-boggling array of character traits, communication styles, and personal beliefs. Often, they have endured a lot of hardship before they meet you. Illness, pain, uncertainty, and long wait times can make the encounter fraught with tension and frustration. Luckily, there are tried and true techniques to transform a challenging situation into a win-win for everyone. Nurses are among the most trusted professionals. Your patients will rely on you to set the tone in the room. Your demeanor has the power to help reassure, calm, and provide hope. The first few moments are a good time to convey your message, and make a great impression. The method is simple, effective, and easy. Approach each person with the understanding that they only want to feel better, and be understood. Good eye contact and a smile may seem clichéd, but are powerful non-verbal cues that you value your patient. If a patient says something, listen non-judgmentally, and avoid correcting if possible. 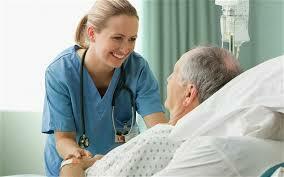 If you enjoy humor, try to feel around and see if the patient would appreciate a light-hearted joke. If you can get a patient laughing, there’s no better medicine. Painful and unpleasant procedures are sometimes a necessary evil in the workflow of a nurse. The age of the patient can have a profound impact on the level of cooperation, and ability to handle discomfort. Children often make mental leaps to the most frightening conclusions, and may not fully comprehend your instructions. A little boy receiving kindergarten vaccinations once asked me if the needle would go all the way through his arm, and if he was being punished for being naughty. All patients do well knowing what to expect, in clear terms, on a level that they can understand, before the procedure is done. An opportunity for them to ask questions in advance, and explain the procedure in their own words can help assuage any fears. If you are called upon to perform painful procedures regularly, become really, really good at them. Practice as often as you can, and learn distraction techniques, such as coughing or counting backwards during a shot. Soon, you’ll have people requesting you and only you to come poke them! Being a great nurse can be as simple as bringing another warm blanket to the patient who is shivering under the air conditioner. If you know what your patient likes, and can have a certain kind of snack, and sneak one into their room without being asked. If a worried family member apologizes for asking so many questions, invite them to ask a hundred more, any time they want. Some computer charting programs will allow nurses to put a note on the chart that will pop up only for you, every time you open that particular chart. If you learn that your patient has a new grandson, or is planning on running a marathon, make a note of it, and remember to ask them about it the next time you see them. These techniques may seem like too much to take on, with your overflowing list of tasks to be done. You will be amazed at how practicing them will end up saving time, and decreasing stress. Your patients will be happier, and you will too, knowing that you have contributed to healing their body and spirit.